Chiltern Chamber is delighted to announce they will be holding their ‘Christmas Elvis Extravaganza‘! 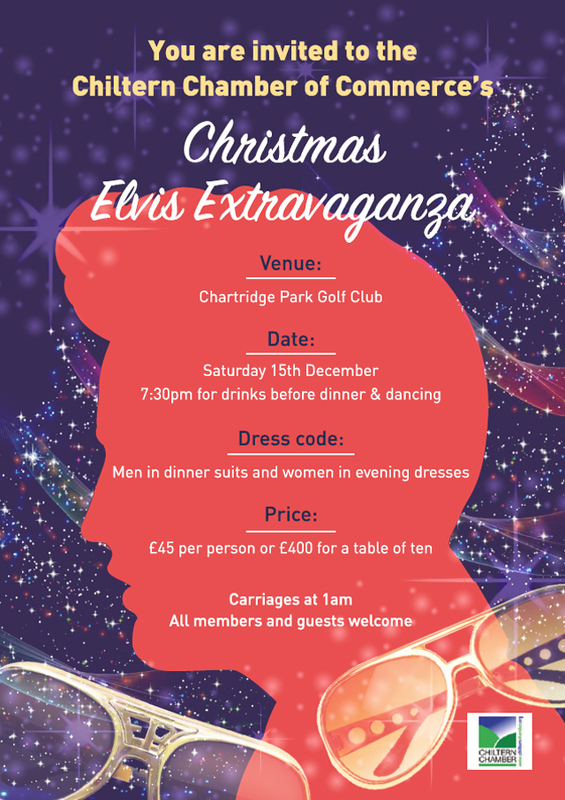 You are invited to join us on Saturday December 15th at Chartridge Park Golf Club. Arrivals at 7.30pm and carriages at 1am. Come singly, as a couple, organise a party… Enjoy a glass of sparkling wine on arrival; feast on a delicious dinner; and then dance the night away to Chartridge’s resident DJ. Are you considering your own Christmas event for business or friends? If so, this could be the IDEAL SOLUTION! Let the Chamber and Chartridge Park’s staff take all the strain. Just BOOK your places, CHOOSE from a list of mouth-wathering options, DRESS to kill and ENJOY yourselves and the company of your guests! Donations will be made to local charities from the proceeds of the evening.